Mourners pack a memorial service for the 19 firefighters who died Sunday. PRESCOTT, Ariz. — Wind more powerful than the gusts that swept an Arizona wildfire over the weekend, killing 19 members of a Hotshot crew, were expected to whip up the flames Tuesday as crews work to corral the blaze feasting on tinder-dry vegetation. National Weather Service meteorologist Jim Wallmann said powerful wind is forecast, with a worst-case scenario of 80 mph gusts. He also said possible weekend thunderstorms could complicate efforts, too. “The winds are going to be a serious factor for us today,” said fire behavior analyst Stewart Turner. Fire spokeswoman Karen Takai said it remains unclear how many houses have burned, but crews were working to figure out the scope of the destruction. The current estimate is 50 homes lost. “It is very difficult for the public out here right now. They’re out of their homes, there’s a lot of uncertainty for them,” she said. For the 19 firefighters killed, violent wind gusts turned a lightning-caused forest fire into a death trap that left no escape. In a desperate attempt at survival, the firefighters – members of a highly skilled Hotshot crew – unfurled their foil-lined, heat-resistant shelters and rushed to cover themselves on the ground. But the success of the shelters depends on firefighters being in a cleared area away from fuels and not in the direct path of a raging fire. Only one member of the 20-person crew survived, and that was because he was moving the unit’s truck at the time. The blaze grew from 200 acres to about 2,000 in a matter of hours, and Prescott City Councilman Len Scamardo said the wind and fire made it impossible for the firefighters to flee around 3 p.m. Sunday. During a deeply emotional memorial Monday evening in Prescott, firefighters walked down the bleachers in a silent gymnasium full of mourners, their heavy work boots drumming a march on the wooden steps. They bowed their heads for moments of silence at the front of an auditorium that was so packed organizers had to send people outside for fear of violating the fire code. The burly men then hugged each other and cried at the end of the service. More than 1,000 people gathered in the gym on the Embry-Riddle Aeronautical University campus as others throughout the state and beyond also mourned the deaths of the 19 Prescott-based firefighters killed Sunday outside nearby Yarnell. The day marked the nation’s deadliest for fire crews since Sept. 11, 2001. Prescott Fire Chief Dan Fraijo spoke in a shaky voice at the memorial as he described throwing a picnic a month ago for the department’s new recruits and meeting their families. “About five hours ago, I met those same families at an auditorium,” he said. “Those families lost. The Prescott Fire Department lost. The city of Prescott lost, the state of Arizona and the nation lost,” he said before receiving a standing ovation as he left the lectern. Authorities are investigating to figure out what exactly went wrong after the wind suddenly changed direction. Atlanta NIMO, or National Incident Management Organization, will be the lead in the probe and will aim to put out a report in the coming days with preliminary information, said Mary Rasmussen, a spokeswoman for the Southwest Area Incident Management Team. The multi-agency group of investigators arrived Monday and was being briefed in Phoenix. Judith Downing, a spokeswoman for the taskforce, said they would go to the fire scene Tuesday. At last count, about 500 firefighters were on the scene, with more on the way. The fire has burned 8,400 acres, or about 13 square miles, as a heat wave across the Southwest sent temperature soaring. Southwest incident team leader Clay Templin said the crew and its commanders were following safety protocols, and it appears the fire’s erratic nature simply overwhelmed them. The Hotshot team had spent recent weeks fighting fires in New Mexico and Prescott before being called to Yarnell, entering the smoky wilderness over the weekend with backpacks, chainsaws and other heavy gear to remove brush and trees. In a heartbreaking sight, a long line of vans from a coroner’s office carried the bodies of the 19 firefighters Monday from Yarnell to Phoenix for autopsies, as the fire burned out of control. In addition to the flames, downed power lines and exploding propane tanks continued to threaten what was left of the town, fire information officer Steve Skurja said. A light rain fell Monday but did little in helping crews gain the upper hand fire. 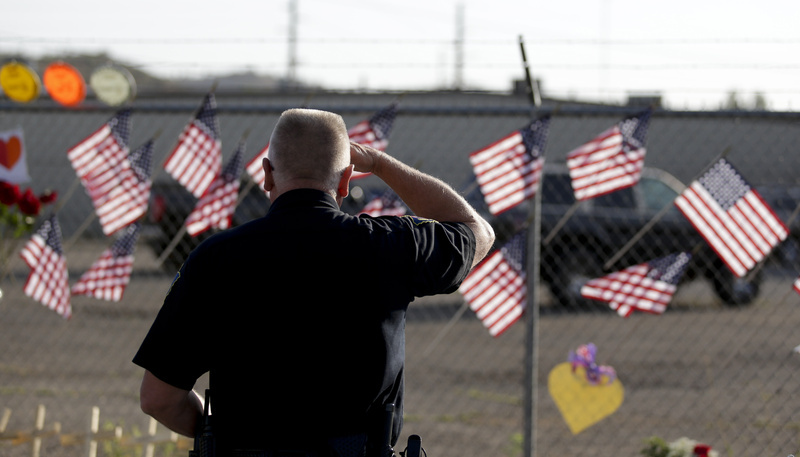 Arizona’s governor called Sunday “as dark a day as I can remember” and ordered flags flown at half-staff. “I know that it is unbearable for many of you, but it also is unbearable for me. I know the pain that everyone is trying to overcome and deal with today,” said Gov. Jan Brewer, her voice catching several times as she addressed reporters and residents at Prescott High School in the town of 40,000. Fraijo said he feared the worst when he received a call Sunday afternoon from someone assigned to the fire. The 19 killed were Andrew Ashcraft, 29; Kevin Woyjeck, 21; Anthony Rose, 23; Eric Marsh, 43; Christopher MacKenzie, 30; Robert Caldwell, 23; Clayton Whitted , 28; Scott Norris, 28; Dustin DeFord, 24; Sean Misner, 26; Garret Zuppiger, 27; Travis Carter, 31; Grant McKee, 21; Travis Turbyfill, 27; Jesse Steed, 36; Wade Parker, 22; Joe Thurston, 32; William Warneke, 25; and John Percin, 24.